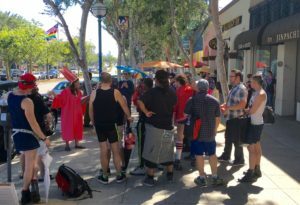 We had another tremendous time sharing Stuart Timmons’ City of West Hollywood Immersive LGTBQ History Tour with audiences on June 3, 2017 as part of the One City One Pride LGBTQ Arts Festival. It was a bittersweet year as our third successful outing, having lost our beloved author earlier in the year. 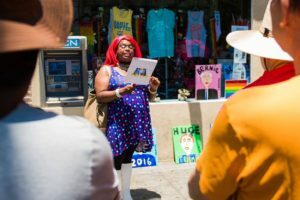 He was with us in spirit though and it was an honor to carry forth his celebration of West Hollywood’s fascinating LGBTQ history. 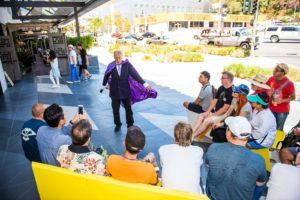 Stuart’s Tour is a fun-filled, fantastically informative, and FREE experience revealing the sensational, sordid, and surprising LGBTQ History of the City of West Hollywood! 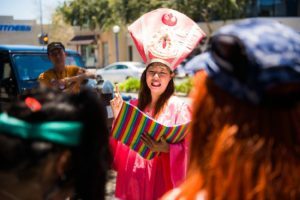 Think you know WeHo? Not quite like this! 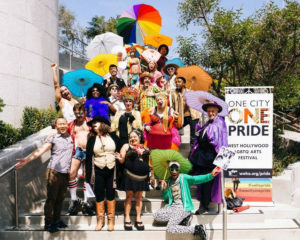 Written by acclaimed author/historian Stuart Timmons (The Trouble With Harry Hay, GAY L.A.) and directed as a performance art piece by Jason Jenn, the tour dazzled audiences in 2015 and 2016. It returns for one more special invigorating event to celebrate Stuart’s legacy and how his life’s work and research is available for all to enjoy. 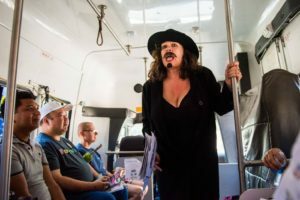 The tour involves a brief shuttle ride followed by a refreshingly accessible urban hike encountering over a dozen costumed characters for surprising fun along the way. 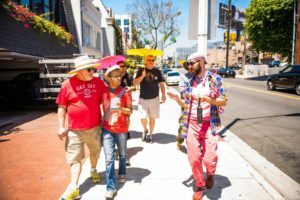 Go West (Hollywood) and join us for the adventure! Free parking is available at the West Hollywood Municipal Parking Structure II just south of the West Hollywood Library. The Welcome & Reservation Station is located in the loading zone just north of the Library along San Vicente Blvd. We’ll sign you up for the next available shuttle, have you sign a release form (you are responsible for your own wellbeing), and validate your parking. While you wait, we’ll treat you to live musical performances! Shuttles depart approximately every 15 minutes with groups of 15-20. First shuttle departs at 11am. Last shuttle MUST leave by 1:30pm. 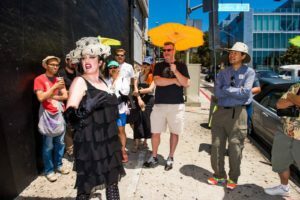 After a brief ride around the city you’ll be dropped off along Sunset Blvd and proceed on foot encountering performers at various stations along the route to deliver the information. All shuttles are handicap accessible and the walking portion of the tour is a predominantly wheelchair friendly route – mostly even level or slightly downhill. Walking shoes and comfortable clothes are recommended. You are welcome to dress in your “pride” for fun if you like! Some refreshments will be available, but we strongly encourage guests to bring their own water bottle/beverage to have at hand during the walk. We will supply colorful parasols for your use to provide some gentle shade from the sun – it also enhances the enchanting atmosphere! 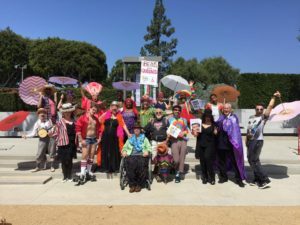 While the tour is absolutely FREE as sponsored by the City of West Hollywood, tips for our large cast of performers are most appreciated and will be accepted both at the beginning and end of the tour.